Also known as Norway lobsters or Dublin Bay prawns, langoustines are pale orange-pink crustaceans, similar to lobsters but a lot smaller. While years ago they were tossed in breadcrumbs and served up with chips as scampi, in recent years they have garnered a foodie fanbase for their sweet, lobster-like flesh, and appear regularly on fine dining menus across the country. Langoustines thrive in cold water, and are abundant in Scottish lochs. 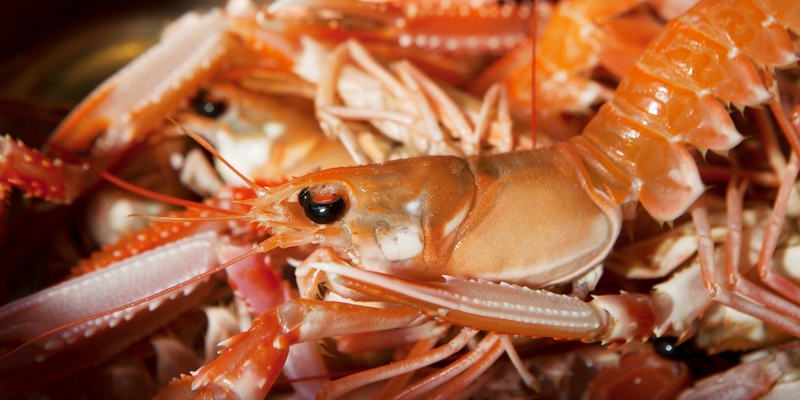 In fact over a third of the world’s langoustines are caught in Scotland, but many are exported to other countries. Langoustines are in season from September to May, and fishing only stops in spring to allow for the breeding season. A lot of langoustines out there are not caught using sustainable methods, so make sure you only buy MSC-labelled, organic or pot-caught. When buying langoustines live, check for shiny jet black eyes, a fresh smell of the sea and quick, lively movements. The legs and antennae shouldn’t be damaged, and the shells shouldn't be marked. The most basic method for cooking langoustines is to simply boil them up and peel at the table. No matter how you cook them, place them in the freezer for 30 minutes or so to stun them before cooking. The cooking of langoustines can be as simple, or tricky, as you want, depending on the desired result. Placing the langoustines straight on a hot barbecue (cut in half lengthways, cut-side up) and cooking for a couple of minutes is a summertime winner, giving the shellfish a slightly smoky finish. To prepare the plump, sweet tails for pan-frying or poaching, you'll need to peel them. . They must be blanched long enough for the outer flesh to firm up slightly (and easily peel away the shell) without cooking them too much inside. To do this, simply blanch in boiling salted water for approximately 20 seconds, then remove from the pan and plunge into iced water. Pull away the head and claws, then squeeze the belly inwards to crack the shell. Peel away the shells and devein by running a sharp knife along the back and removing the black intestinal tract. Finish cooking the langoustines either by pan-frying in plenty of butter until opaque, or by poaching in a sauce, soup or stock. The sweet flavour of langoustine is similar to that of lobster. Serve them with clean, simple flavours and allow the delicate flesh to speak for itself, as Martin Wishart does in his langoustine ravioli recipe, served with orange-braised endive. Langoustines are quite commonly used as the ‘surf’ in surf and turf dishes, often paired with pork. Tom Kitchin, champion of Scottish produce, pairs the luxurious shellfish with secondary pork cuts in his signature salad of rolled pig's head with langoustine for an unusual take on the dish. Spain and Italy have always held the crustacean in high esteem. If you’re looking for a simple but luxurious canapé, wrap a pan-fried tail in lardo or jamon for a divinely sweet and salty bite. James Mackenzie pairs them with the delicate flavour of wild rabbit, topping the dish with a punchy Parmesan and wild garlic crumble. Paul Welburn’s summery chargrilled langoustine recipe makes the use of the whole langoustine by making a bisque out of the shells and pairing the sweet, delicate flesh with lightly pickled fennel and umami-packed seaweed butter.